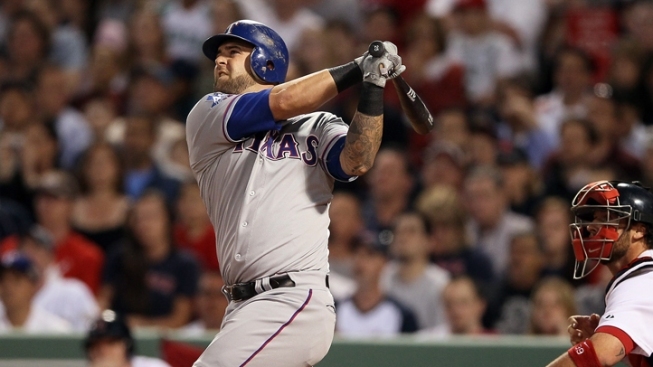 Mike Napoli is headed back to Texas, where he played in a World Series before going on to win one with Boston. The first baseman was traded Friday to the Rangers from the Red Sox for a player to be named or cash. Boston also sent money to Texas as part of the deal, which came a week after baseball's deadline for trading players without placing them on waivers. Rangers general manager Jon Daniels said reacquiring Napoli fills the team's need for a right-handed bat with power. "He is a guy who always hits lefties. It's an area where we have struggled this year," Daniels said on a conference call Friday night. "He is a guy we know. We know he's going to fit our culture. He has a winning makeup." Minutes before the first pitch of Boston's game at Detroit on Friday night, Napoli was removed from the lineup. He batted .207 with 13 homers and 40 RBIs in 98 games for the last-place Red Sox this year and can become a free agent after the season. Napoli, 33, was a fan favorite during two productive years in Texas before signing with the Red Sox and helping them win the 2013 World Series. "He was a core member of that team on the field, in the clubhouse, the unity in which that team was so strong," Boston manager John Farrell said. "Nap was one of the leaders in that way. Middle-of-the-order bat that allowed us to get off to such a great start with the production he had in April, and then in September and the postseason, he once again kicked it in." Napoli batted .320 with a career-high 30 homers as the Rangers won their second consecutive American League pennant in 2011. He hit .350 with two home runs and 10 RBIs in the World Series loss to St. Louis. The following season, Napoli had 24 homers in 108 games and was the AL's starting catcher in the All-Star Game. With his return to Texas, Napoli is back in the playoff chase. The Rangers (54-53) had won four straight entering Friday night's series opener in Seattle and were 2 1/2 games behind in the race for the second AL wild card. Texas was 5 1/2 back of first-place Houston in the AL West. "This is really about 2015. He fills a need for us," Daniels said. Hoping to make a postseason push, the Rangers' front office has been aggressive lately. Texas acquired ace lefty Cole Hamels and reliever Jake Diekman from Philadelphia at the trade deadline, plus reliever Sam Dyson from Miami. While the three pitchers obtained last week are under contract or Rangers control for multiple seasons after this, Napoli is not. Mitch Moreland started his 70th game at first base Friday night, while Prince Fielder was the designated hitter for the 90th time, along with his 15 starts at first base. They were among five left-handed batters in the lineup against the Mariners. Napoli is expected to join the club Saturday, when the Rangers are set to face Seattle lefty Mike Montgomery. Daniels said the initial plan is for Napoli to be the DH or first baseman against left-handers, and only be used as an emergency third catcher, similar to the role he has had with the Red Sox. "Once Nap cleared trade waivers, we reached back out to a handful of teams that we had been in touch with prior to the deadline," Boston general manager Ben Cherington said. "That all happened within the last 48 hours or so, and just happened that Texas ended up being a team that seemed like the best fit and an opportunity for him to go back to a place he's familiar with and play in a role that should fit him." The Rangers were hitting just .238 against left-handed pitching, ranking 24th in the majors. That's been one of Napoli's strengths in the past, but he's batting only .229 against lefties this season. Before this year, Napoli was a .279 hitter in his career against left-handers. Texas transferred Kyle Blanks to the 60-day disabled list to clear a spot on the 40-man roster. The Rangers will need to make another move to open a spot on the 25-man roster when Napoli arrives.